Portugal, or at least the region in which we stayed, was far richer in wildlife than most if not all of Denmark. The diversity and sheer number of bird species we witnessed far outcompeted anything I’ve seen even in the largest nature reserves in my country. Even so, when we entered the Faia Brava reserve, the difference was immediately noticeable. While the towns and arable fields of the surrounding landscapes had been home to a great number of animals, the reserve was in a league of its own. 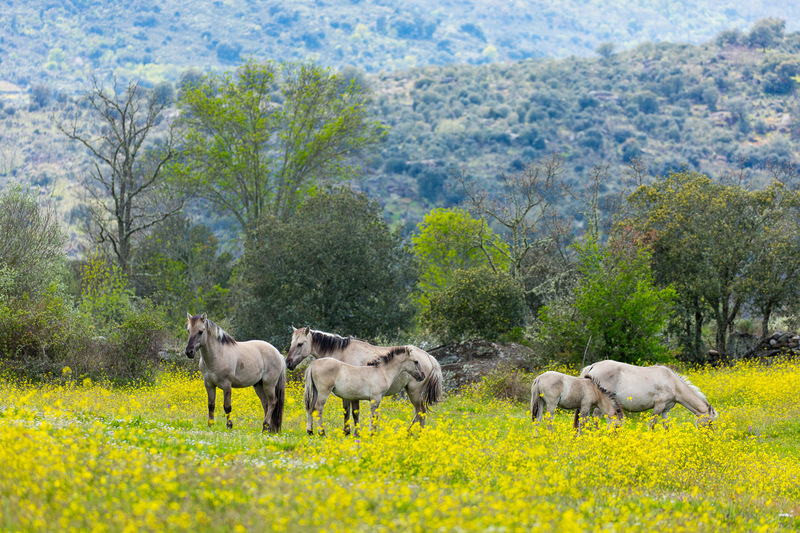 Free living Sorraia horses in Faia Brava nature reserve, Western Iberia rewilding area, Portugal. Insects occurred in countless numbers, birdsong was everywhere and the vegetation was thick and lush. The explanation for this is probably down to a variety of factors, but one of the primary ones must undoubtedly be the great diversity of habitats found within the reserve. On less than 1000 hectares there are meadows, wetlands, open woodlands and rocky crags, along with caves of varying sizes, dozens of ponds, and steep cliffs. This mosaic of habitats provides so much variety that it almost seemed as if with every turn we took the landscape character completely changed. 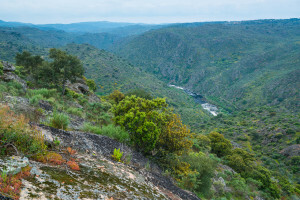 Breathtaking Côa Valley, Western Iberia rewilding landscape, Portugal. Part of this diversity of habitats, at least with regard to the wetlands and waterways, was a product of the seasons, as the area dries to a crisp in the summer, with even the roaring Côa river withering away completely during the hottest months. These seasonal changes were an interesting thing to observe, as we also happened to arrive just as the last of the wintering birds were leaving and the summer migrants were arriving. Many of the summer migrants in the reserve and surrounding regions are actually winter migrants in Denmark, and thus were quite familiar, but a good deal of the winter migrants and sedentary species were unique to the area, at least compared to Denmark. In general, while many of the species we saw are also found in Denmark, what really differed was their abundance. Species common around our home, especially those associated with open water, were very rare and restricted to a few of the region’s larger lakes, while species quite uncommon where we live, such as larks, grouse and kites, were incredibly abundant. While I was told that common buzzards were, like in Denmark, the most common bird of prey in the region, for every one of them I saw, I counted at least a dozen kites, both red and black, not to mention numerous vultures. Tristan birdwatching in Mid Côa Valley, Western Iberia rewilding landscape, Portugal. Speaking of the vultures, they are in many ways one of the primary draws of the reserve. Faia Brava spans the sides of a steep cliff, a prime nesting locale for vultures, and is home to a great abundance of these birds. By far the most common species was the Griffon vulture, which can be spotted throughout the region but was particularly numerous in and around the Côa valley. The other, less abundant, vulture species found in the reserve was the Egyptian vulture, a significantly smaller animal and very distinct in appearance with its white plumage and bright yellow head. Throughout the day, one could see them soaring in the sky, and since we visited in spring, we had the opportunity to peek into their cliffside nests. 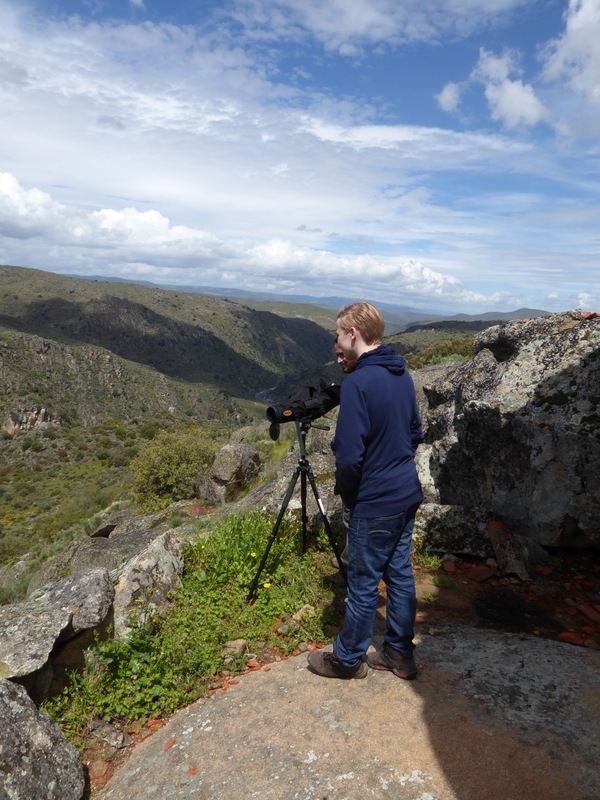 Iberia is the vulture hotspot in Europe, and while these large birds are found throughout the southern parts of the continent, once even ranging as far north as Britain, Spain and Portugal are the places where you will see them in the greatest numbers. Here, the climate is amicable and the rocky geography rich in nesting spots, making it an ideal place for vultures. Still, there are problems, chief among them the fact that vultures are scavenging birds, and Iberia has in recent years grown increasingly scarce of carcasses for them to consume. This problem is not absent in the reserve but it is diminished, in part because the birds are fed on an irregular basis – an event that serves as one of Faia Brava’s primary attractions, and a spectacle which we got to observe. On top of this, natural processes have more space within the reserve, with dead animals being allowed to stay and decay. Due to the near complete absence of deer, the carcasses found are typically restricted to those of smaller animals, ones which provide little food. But on occasion, when one of the semi-feral horses or cattle dies, the vultures are simply too fast for anyone to remove the bodies before they are eaten. Death is certainly not the only way in which the cattle and horses help improve the natural processes of the reserve, as they are keystone species and therefore vital parts of the ecosystem. The Maronesa breed is well adapted to the rough landscape of Western Iberia: rocky, dry and with few vegetation in the summer. Their influence throughout the reserve is obvious, from the ponds and ditches that they create by scraping the ground and forming depressions where they sleep, to the meadows and openings in otherwise dense vegetation – a result of their grazing and browsing. Fire is a large problem in Faia Brava and the surrounding regions, and without the grazing pressure exerted by large herbivores, the entire reserve would become overgrown, not only diminishing the biodiversity, as many species depend on open areas, but greatly increasing the fire hazard, as openings in the vegetation function as natural firebreaks. On top of these practical benefits to the ecosystem, the wild-living horses and cattle are also one of the reserve’s top attractions. While neither species is rare in the region, or the rest of Europe and the world for that matter, seeing them living in such a wild state is indeed an unusual sight, and definitely one worth seeking out. Watching a large herd of cattle emerge from the brush, somehow completely unnoticed up until this point despite their large size and great numbers, is a thrilling experience, as is watching a large gathering of horses and their foals from the shade of a tree. The animals in the reserve are shy and often difficult to find, but they are still noticeably different in behaviour from true wild creatures, often allowing people to get at least relatively close without fleeing, and lacking a strong fear instinct towards humans. Laws and regulations unfortunately prevent them from being completely left to their own, but the state in which they live in Faia Brava is certainly as close as one can get within the limits of the law, and allows for them to interact with the ecosystems of the reserve as truly wild. 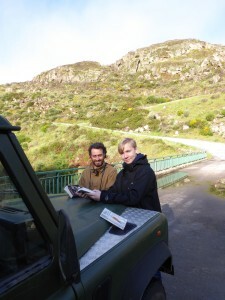 Tristan Soebye Rapp and Eduardo Realinho exploring the Faia Brava nature reserve. I was very impressed by my time spent in Faia Brava. The area really is a proof to the effect that the hard work of private individuals can have in conservation, that the government does not always need to be directly involved in even ambitious projects for them to be successful, and that rewilding works at many scales. Following briefly on the last point, rewilding is often seen as an endeavor that takes a great amount of space, requiring tens of thousands of hectares before it’s even worth considering. In recent times, it has become increasingly apparent that this is not true, and that depending on the approach, rewilding can easily be scaled to accommodate the amount of space available. Places like Knepp Wildland in England are high profile examples, and Faia Brava certainly deserves to be acknowledged as yet another proof of this. 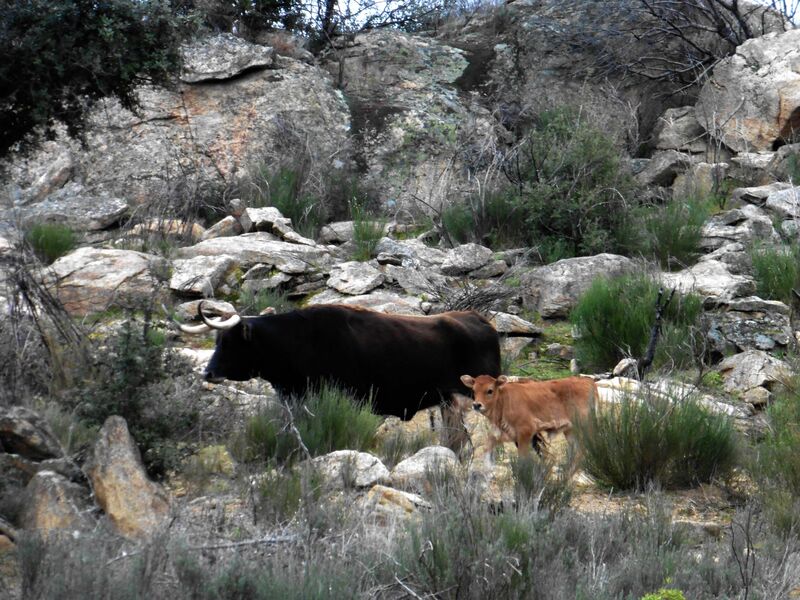 At only about 1000 hectares, the work put into habitat restoration and other forms of rewilding is already paying off in an obvious way, a fact that I find truly impressive and inspiring.